I Wore This | I Get Dressed In The Morning! Today I’m bringing you a super cool outfit post from Wednesday! I’ve been toying with the idea of doing outfit posts again, part of me always feels something of a phony, as I don’t really see myself as all that stylish, but I do enjoy putting fun little looks together, and it was always nice to document those looks previously! 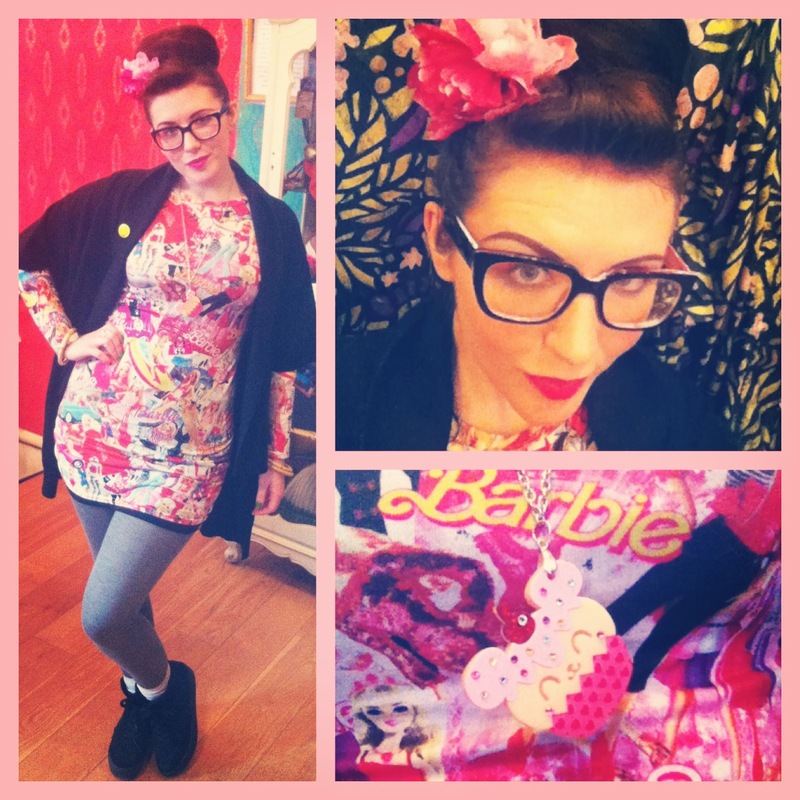 Here is what I wore on Wednesday! You may all notice that I now have a fringe, and that the rest of my hair is ridiculously long, oh and that the ends are green… basically it’s super different, but I love it like this more than any other hairstyle I have had! It was done by the amazing Rachel at the Leeds branch of Philips Hair Academy, and I can’t recommend her enough! Onto the outfit! 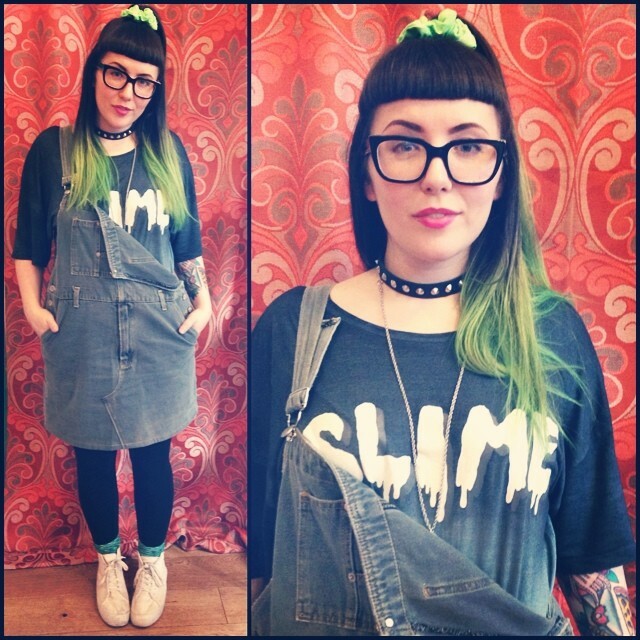 I love this one as it makes me feel like a super cute slime princess! 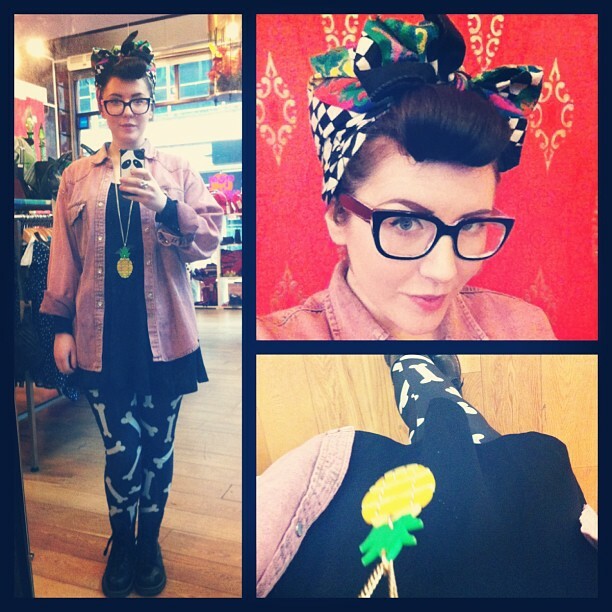 My dungaree dress and scrunchie were both from the shop I manage in Leeds, Pop Boutique. The dress was £18 and the scrunchie was £3.50, both absolute bargains! My leggings are trusty H&M. I did used to opt for Primark leggings, as they are dirt cheap. But with a reduced price comes reduced quality. quite often the Primark leggings just looked semi transparent, and that really isn’t the look I am going for. I must admit, however, that my shoes and socks are from Primark. The shoes were £8, which is a good job because they are the stupidest purchase I have ever made. I don’t know when I ever thought I would be able to keep white canvas shoes clean. Finally, my jewellery is just stuff that I have had forever. The collar has been around since I was about 15! I know for a fact that these collars can be bought in any good heavy metal/goth type shops for about a fiver. My long necklace just has a simple fake gem on it (which I’ve just realised you can’t see! ), and I found this similar one from Etsy seller Hanging By A Thread, for just over £16! Thanks for checking out my outfit post! I’ll post more from now on, and if you have any questions for me, feel free to ask in the comments below! My Super Stylish Birthday Blowout! I know I haven’t posted anything for a while, but I was mega busy and also had a few technical hitches which (hopefully) should be sorted out now! So… On with today’s update! IT WAS MY BIRTHDAY ON SATURDAAAYY! The celebrations started on Friday when I went out for food with my best friend Samantha, the boyfriend, my brother, my dad and mys stepmum. We had amazing Japanese food and talked far too much! 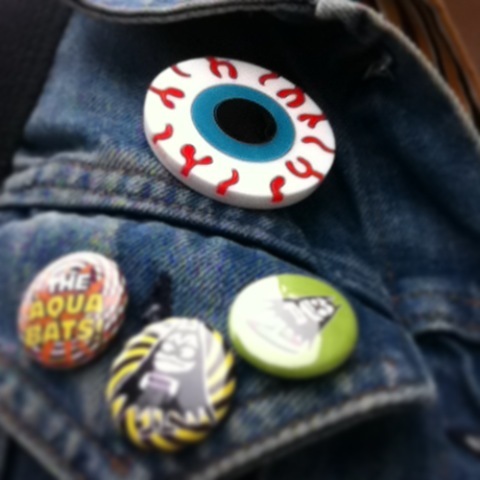 Saturday morning saw me and Samantha up early to watch some Aquabats and get ready for a busy day organising my party! We went for food at Primo’s hotdog joint in the Corn Exchange in Leeds (a wonderful shopping spot, containing some real independent gems such as Candy Candy, Mad Elizabeth and much more!) This particular Saturday, The Corn Exchange was playing host to one of Leeds’ main vintage shopping fairs, Judy’s Affordable Vintage Fair. 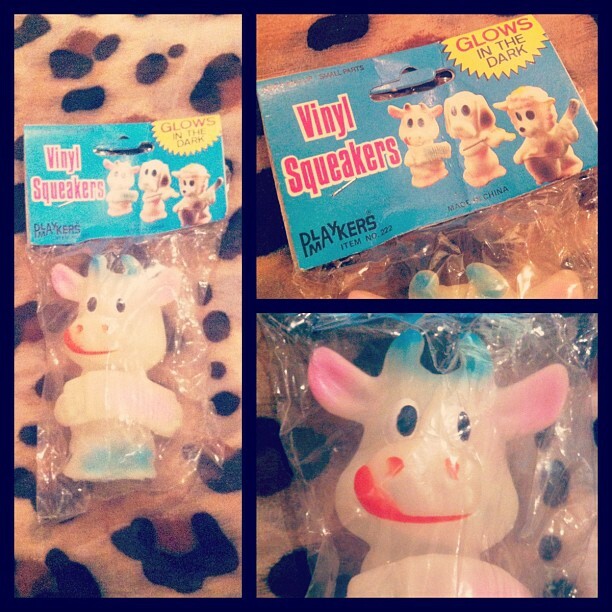 We had a browse and I bought myself a super kitsch glow in the dark retro toy! 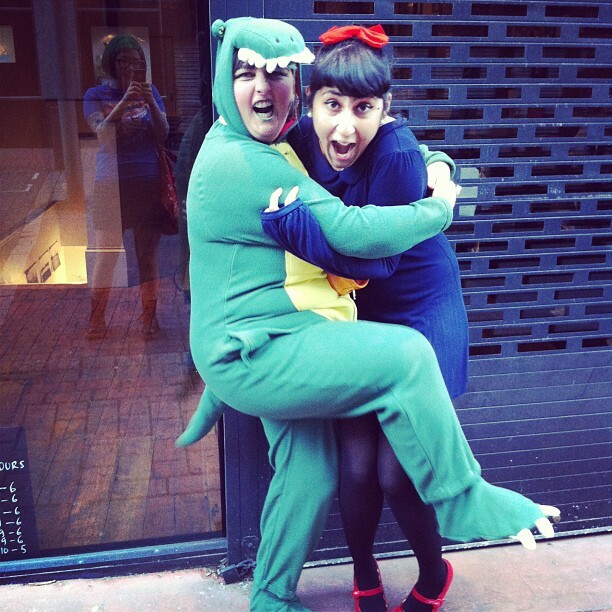 The rest of the day was spent shopping for things for my fancy dress party! We buzzed around town, found a costume for Samantha, bought far too much kids party food and even found time to go home and drink some tea and do our makeup! 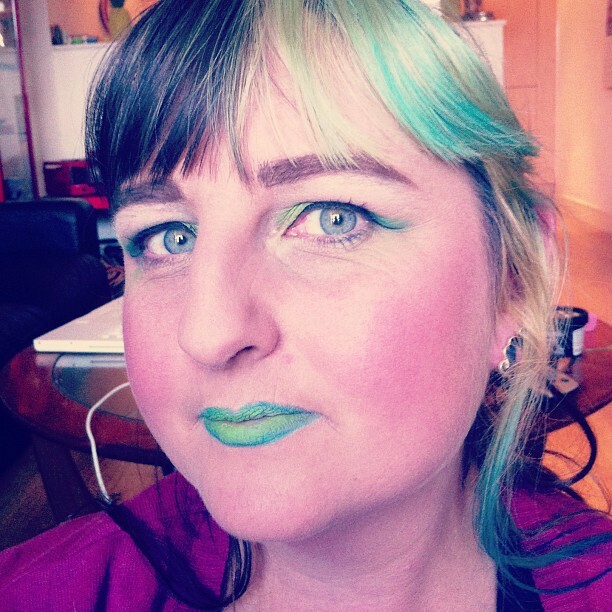 I tried my hand at some green makeup on Samantha to go with her crocodile costume! I used Illamasqua eyeshadows to create both the eye look and lip look, I didn’t really have a plan and just got creative! I’m super pleased with how it came out! 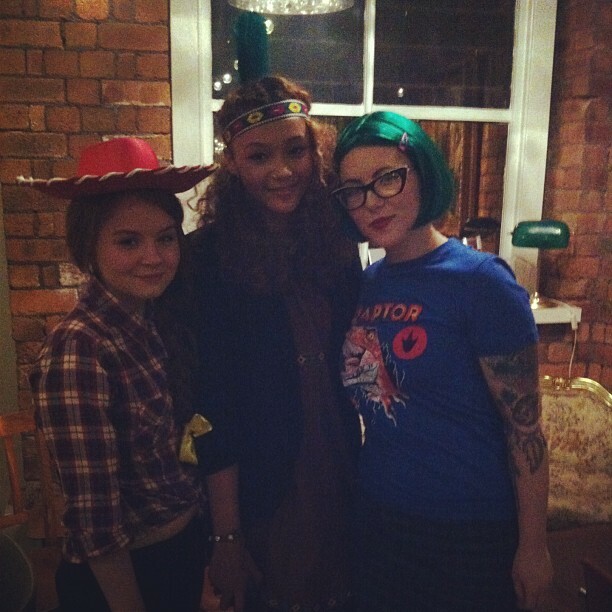 The party was held at Mrs Athas and everyone made a real effort with their costumes! It was so lovely to see everyone there to celebrate with me! 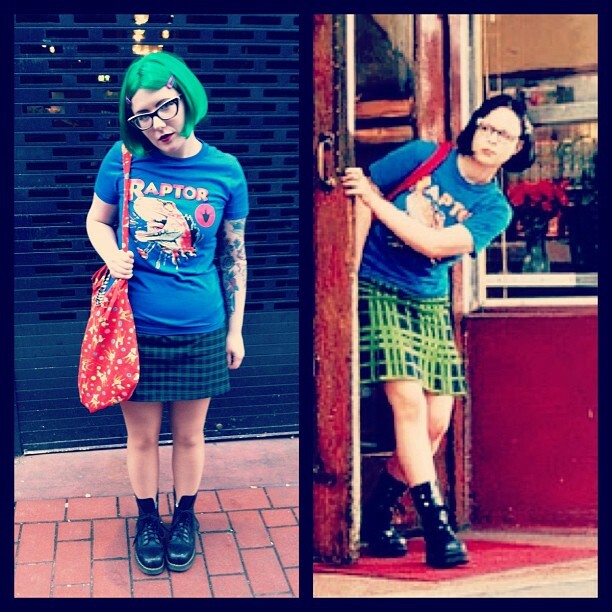 I dressed as my favourite film character, Enid, from Ghost World! 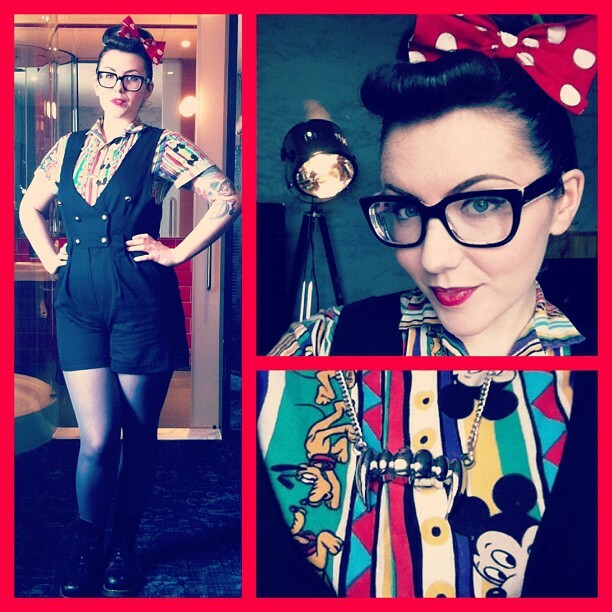 Here are some highlights..
My playsuit is vintage and from Pop Boutique, I have had the shirt for years and years (It was bought in Disneyland Florida when I was 6!!! ), the vampire necklace was a Primark find and my docs are vintage too! Most of my makeup is Illamasqua, as usual! We checked into The Hoxton Hotel to discover we had been given the Cabin room!!! The Hoxton has designer rooms on it’s top floor which are all styled and themed differently. I had always wanted to stay in the cabin room! It has a giant bed, a shower in the middle of the room and lots of lovely details in the soft furnishings! They provide design books for you to browse and you even get a free Pret breakfast in the morning! Check out their website for more information! The next day was spent SHOPPING MY SOCKS OFF!!!! 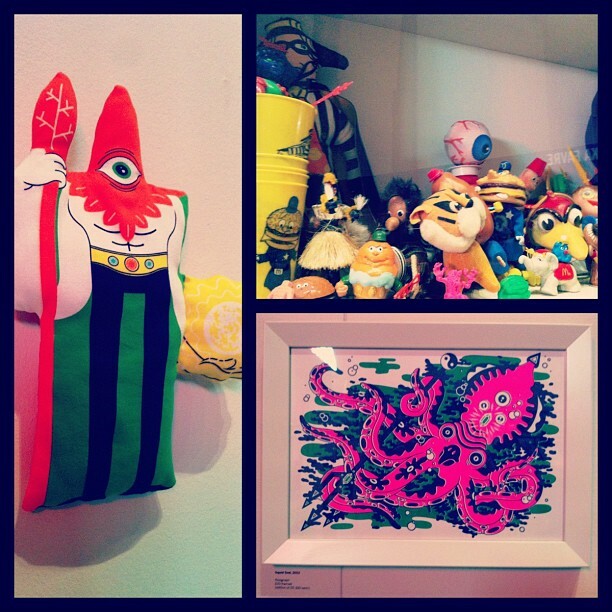 I had already planned to stop off at Lazy Oaf and Johnny Cupcakes but we also hit up Uniqlo and Topshop! 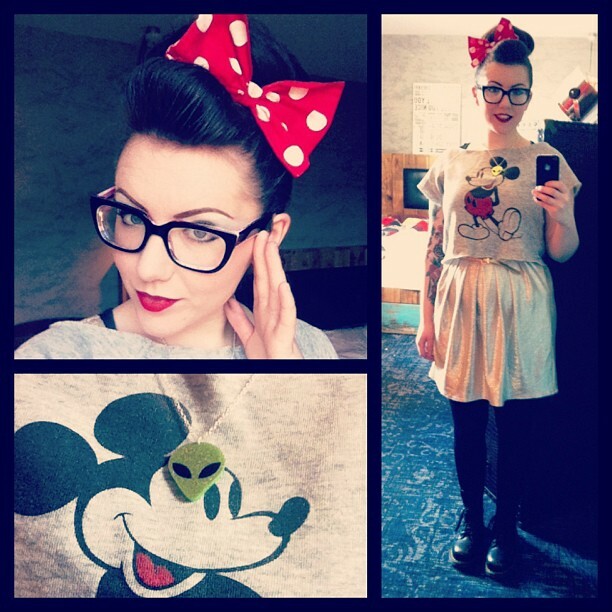 I wore my second Disney themed outfit of the trip too! Just take a look! The dress was on sale at Topshop! I wore a vintage Mickey crew neck over the top which I customised myself and turned into a crop top, I also wore my new necklace by Sugar and Vice that my wonderful friend Charli got me for my birthday! Check out my shopping haul!! 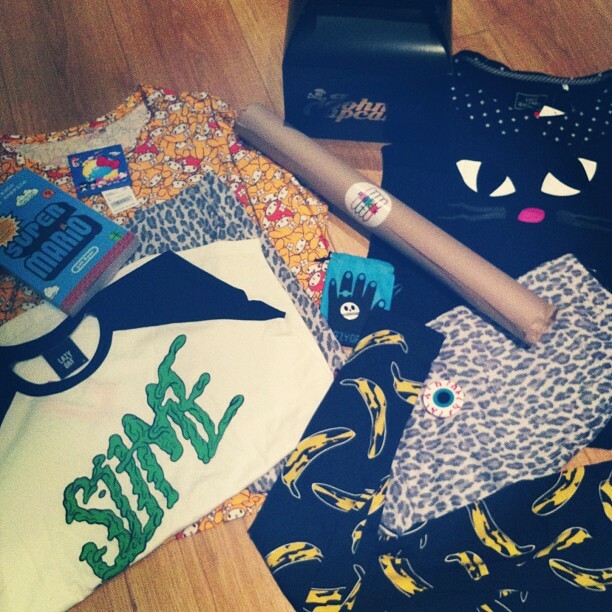 I bought: the Lazy Oaf slime tee I had been lusting after, a little Lazy Oaf skeleton pin, some banana print leggings from Topshop, a Johnny Cupcakes breakfast tee (in the box! ), a book about Nintendo, Lulu Guinness cat face tee, Leopard jeans and My Melody tee from Uniqlo and also pictured are the badge and (rolled up) print i bought at Pick Me Up! Overall it was a super busy and fun weekend! Over the next few days you’ll probably see me uploading outfit posts of all my new things!! Does anyone have recommendations on where to go in London next time I take a trip down there? 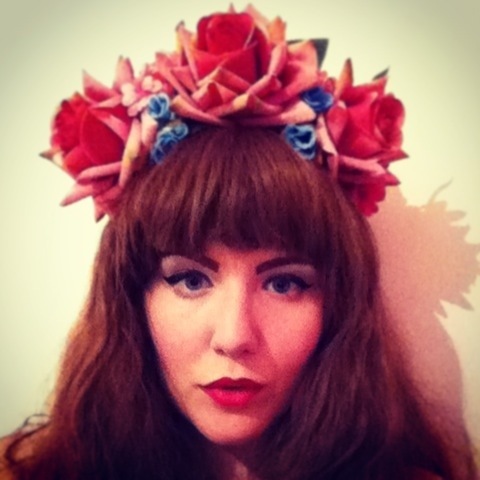 Please share your DIY flower crown photos through my Facebook page or by hash tagging ‘igetdressedinthemorning’ on Instagram! These leggings are my new favourite thing, they are from Lazy Oaf and are £45, the plain black skater dress is from H&M and the shirt and scarf are vintage from Pop Boutique. 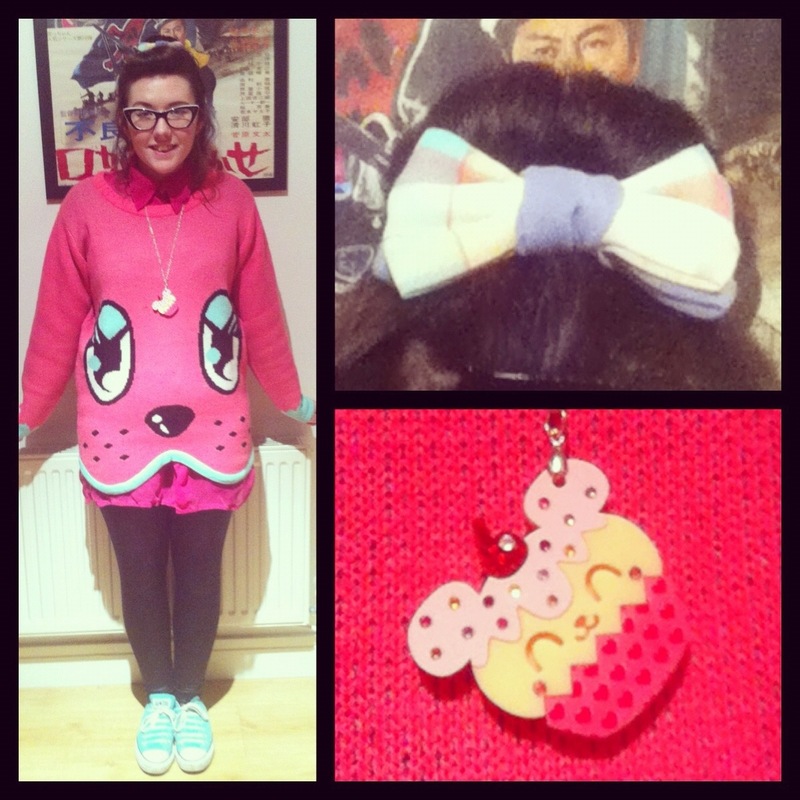 My necklace is by the wonderful Tatty Devine and my boots are steel toe capped Doc Martens. I found some look-a-likes for you guys (click pictures to go buy)..
Here’s a nice pink denim shirt for sale on Etsy! The best boots in the world thanks to Dr Martens (it’s all about the steel toe cap!).. And finally, a cute check headscarf from Lulu in the Sky on Etsy to complete the look..
You can follow me on Instagram if you like my style and my blog, my name on there is ‘igetdressedinthemorning’. I also have a facebook fan page under the same name, so please go ahead and give that a ‘like’ too! Today was another busy workday, i’d never complain though, my job is great! I wanted comfort today so I opted for this super cosy get-up! I bought this dress earlier in the week and it was delivered yesterday so it is literally fresh out of the packet!! It is so adorable I couldn’t resist wearing it straight away! My dress is from Verity Styles (you can find their Facebook page HERE), leggings are from M&S, drape cardigan thingy is from H&M (years ago!) and my shoes are from Office. I’m wearing THE cutest necklace by Kuma Crafts, it actually has little Swarovski crystals as sprinkles! I also did my nails this evening.. I used Illamasqua nail polishes in Obsess (pink) and Radium (green) and some cheap black eyeliner as a nail art pen.. super simple tip for you there! I top coated it so it would all stay put, but i’m STILL struggling to find the perfect top coat! Being a junk food poseypants! 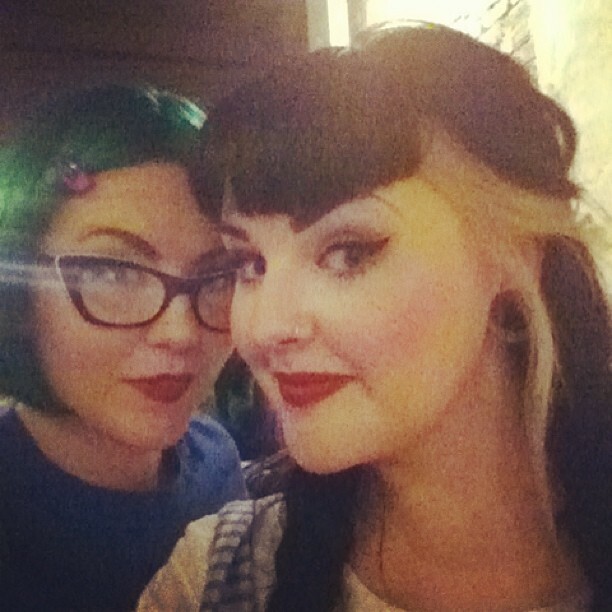 This weekend my wonderful best friend (photographer Sam of Wicked Heart Photography) came to visit me for a few days! We usually go shopping, but this time we fancied staying in, where it’s warm! On the Saturday we had another of our friends come visit, the beautiful Emma with her sister Rachel who had come to do our nails! 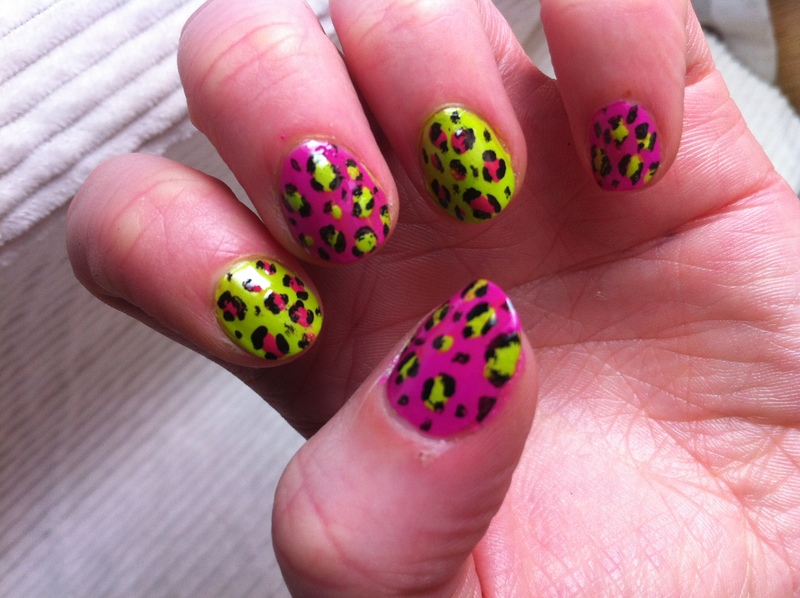 I had tips put on and later decorated my new claws with my own nail art creations. Sam had cute lilac gels put on with adorable iridescent shell flakes! 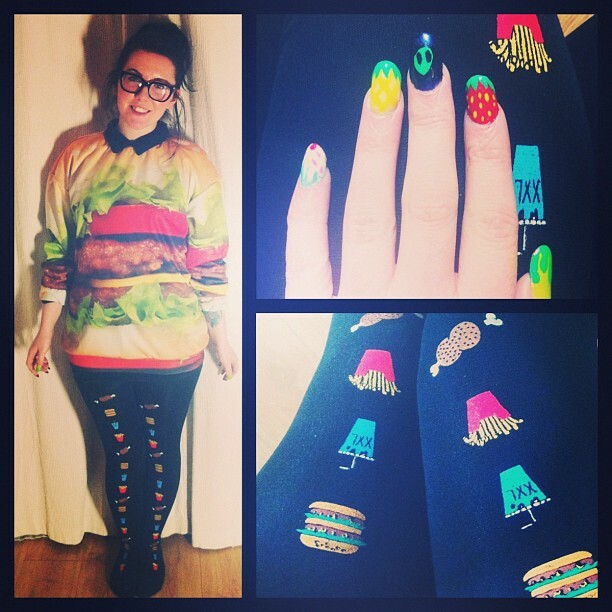 I wore a new outfit for this girly occasion, my junk food tights, a vintage sheer blouse and my brand spanking new burger sweater! I made myself hungry all day in this get up! If you would like tutorials for any of the nail designs I have done please hit me up with a request through my email katykamikaze@gmail.com or in the comments below! Posing in my room at the wonderful Hoxton Hotel! Me and boyfriend like to take a trip down to London roughly once a month, it’s a great way for us to spend time together as he works super hard! 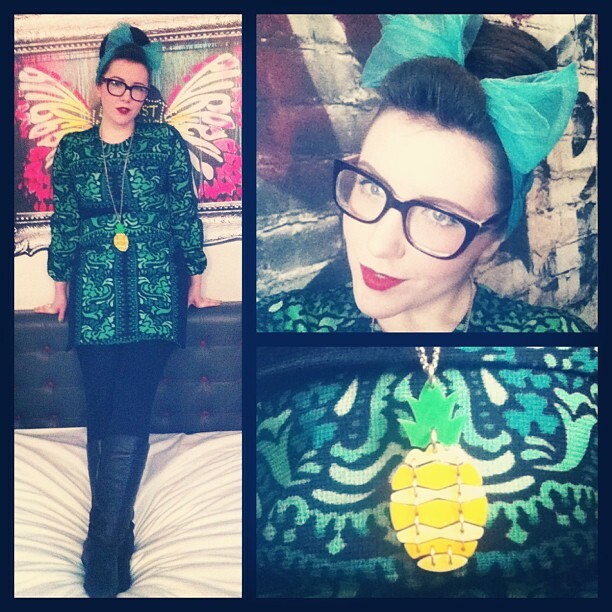 My necklace is by Tatty Devine and was bought on another London trip from their Covent Garden shop! I had to wrap up warm today people, it’s COLD out.. in case you didn’t notice! I wore my cute red vintage dress from Pop over a long sleeve bodycon dress, high waisted black jeans and some super comfy vintage boots! 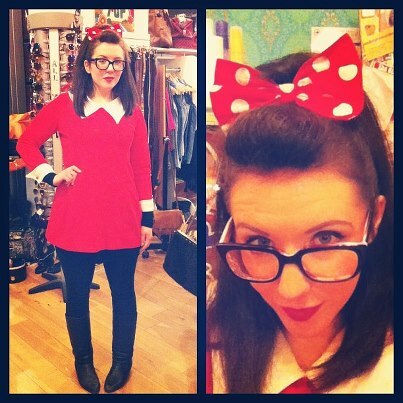 The glasses you see in this picture are my new ones from Spex in the City! Boyfriend bought me them for Christmas! They are by a company called Jensen and were limited edition. I’ll be doing a post on my love of specs soon so keep reading! I’ve decided to have a look on the internets to see if I can find similar items to my outfit pieces, as I feel bad when everything is vintage! 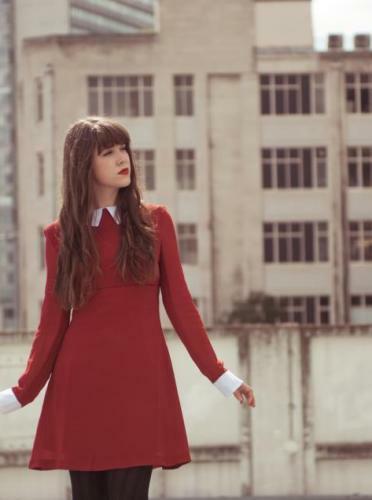 Pop Boutique made a pretty sweet dress for their own line which looks pretty similar to the vintage one I wore today! 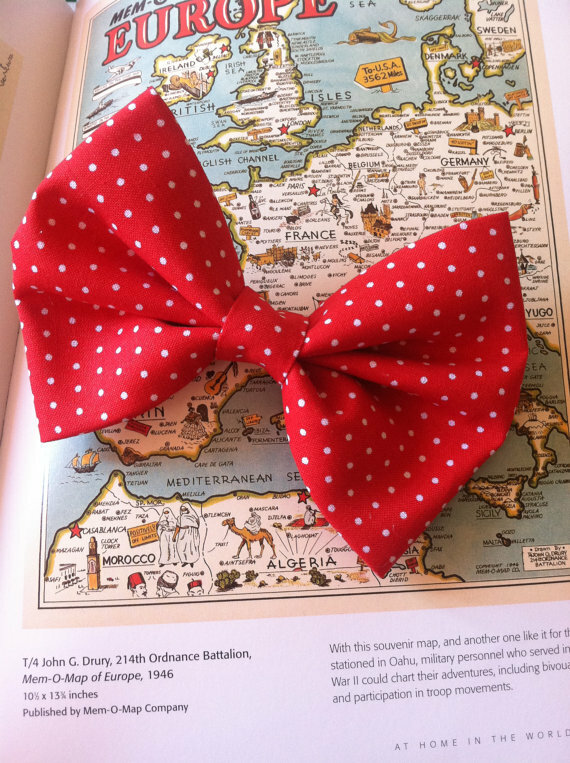 Take a peek..
Etsy has a huge range of spotty bows.. Here’s one from Sprinkles Corner.. This one is only £2.00!! Buy it here. Office do these cute knee highs that have a slight 60’s go-go vibe! Buy them here! 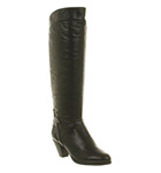 They’re in the sale for £30!! I’ll leave it at that for tonight! Tomorrow I’ll be trawling Etsy for my pick of the most recent Cute, so it’s adieu until then! 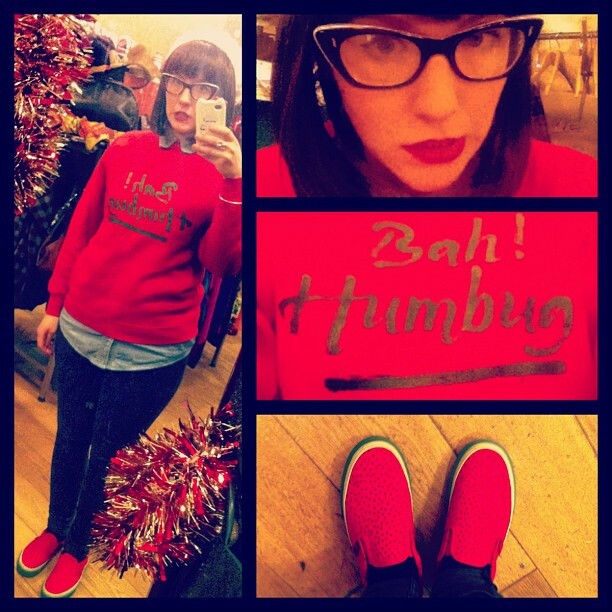 I LOVE this jumper I got from Pop Boutique… I am THE most excitable person I know, especially around Christmas time.. I’m not religious, I just love food, gifts (giving and receiving) and people being all sparkly and happy.. So the irony of this jumper is PERFECT to me! I’m wearing it here with a weird face, a vintage denim shirt, my trusty H&M high waisted skinnies (which I now can’t find anywhere – help me! ), A wig from Annabelles Wigs, a sparkly white slouch hat from the kids section of H&M and my watermelon vans! Just you wait to see what I’m wearing on Christmas Eve!!! Here’s what I wore at work today! -Sweater by Japanese brand Galaxxxy bought from JapanLa. -Shiny leggings I have owned for a long time. -Vintage sheer pink blouse from Pop Boutique. -Vintage Converse from Pop Boutique. -Pastel bow from a mall in Ikebukuro, Tokyo. This is a nice comfy-but-cute outfit for Sundays at work! I promise ill post more outfits from now on!